Indian brides make for the most beautiful brides in the world with lot of embellishments and ornaments adorning the bride. 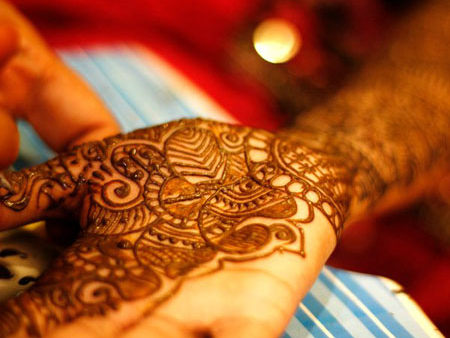 Mehandi is one of the sixteen adornments in the Hindu tradition without which a bride is incomplete. This event happens before the wedding and is accompanied by haldi ceremony. Mehandi Accompanied By Music & Dance: Earlier it was just the ladies of the house playing dholak and singing old folk songs. This has become more entertaining now where in all the female members of the family perform dance along with the traditional ways of celebrating. Quirky Setup: Since this tradition is relatively lighter, people opt to break form the usual and simple decor and go for a more brighter decor. Flower Jewellery: Mehandi is all about preparing the bride for the wedding and a recent trend found is using flowers not only to decorate the vicinity but to adorn the bride also. The bride wants to look as natural as possible during this ceremony. And usually after this ceremony the bride does not leave the house till the wedding. Other trends are also catching up for this ceremony like creative ways of dressing up, theme specific decor, photo booths, etc. This is an event to pamper all the women in the family and something to look forward to at any wedding.